Ecologix provides comprehensive wastewater treatment technologies and services for the automotive industry, including E-Coat paint processes. To learn more about a specific Automotive wastewater treatment application, call on one of our Professional Engineers, schedule a consultation or request a budgetary proposal for your specific requirements. 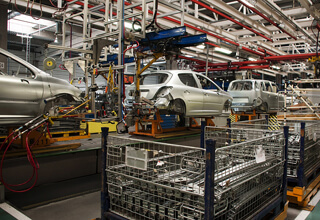 Automotive manufacturers use a water-borne Electrodepostion (E-Coat) paint process that produces various wastes containing Zinc (Zn), Nickel (Ni) and Phosphorous (P). Most of the waste is found in the rinse waters from the e-coat overflows that contain less 1000 mg/l TSS. Some of the “dumps” contain detactified paint waste concentrate in small quantities. The various combinations of the waste create a unique treatment challenge. At the Equalization Tank various wastewater streams are blended and homogenized. Treatment is accomplished by using a physical/chemical process – raising the pH of the wastewater to the minimum solubility of the combined metals, adding coagulants and flocculant(s) to enhance settling. The separation of the solids from the clean water is accomplished using a large incline plate clarifier. Solids settle into a cone type hopper and the effluent flows to a multi-media filter for further polishing. pH is readjusted to permitted discharge levels and the water is discharged to the city sewer or optionally recycled for internal use. The images here are from the wastewater treatment facility built by Ecologix for KIA Motors at their facility in West Point, Georgia. The system includes EQ tankage, chemical feed pumps, reaction tanks, a 300gpm Incline plate clarifier, tertiary filters, sludge dewatering filter press, and various mezzanines and catwalks for service access.